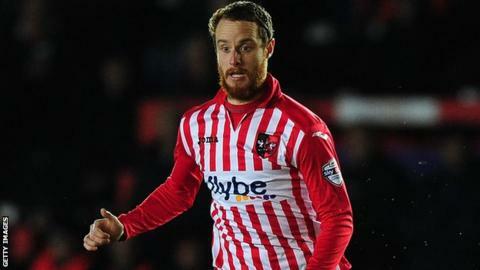 Manager Paul Tisdale has praised midfielder Ryan Harley for his "immaculate" defensive performance in Exeter's League Cup win at Swindon. Goals from Alex Nicholls and David Wheeler earned the League Two victory over their League One opponents, despite Jon Obika's second-half reply. "I have to say, over my nine years, he's been one of my best defenders," Tisdale told BBC Radio Devon. "He covers the right areas, he cuts off the lines and he's very intelligent." "His performance tonight with hardly touching the ball was immaculate." Harley's efforts helped Exeter hold on for only their second League Cup victory in 10 years, despite Swindon dominating possession and having 15 more shots at goal. "It was a fantastic win for us," Tisdale added. "Sometimes you've got to put your pride aside and we agreed as a team that we'd let them have the ball, play connected and defensively close, and try to catch them on the break." "I'm not too proud to admit it - we allowed them the ball, but we wanted to be fast and accurate on the break and I think the first half showed that was a plan that was worth taking."